When analyzing the confrontation of two contrasting geopolitical and geostrategic principles in Serbia (the Serbian ethnic area in general), we can see a continuous and unobstructed course of Serbia towards the Atlanticist geopolitical space, and dissonance related to Eurasian integration. The corrosive course, which started before the fifteen years following the October changes, during the government of explicit pro-European orientation, Boris Tadić and the Democratic Party, did not stop or at least slow down during the reign of Alexander Vučić and the SNS, but, on the contrary – it intensified. Aleksandar Vucic, although he came to power with moderate nationalist rhetoric, in terms of concrete actions, he did more in approaching the Atlanticist geopolitical zone than did the government formed by the Democratic Party of Boris Tadić. Aleksandar Vučić represents a very specific and unique political phenomenon in the entirety of modern Serbian political history. This politician is, since the establishment of modern Serbian state in 1815, certainly a formulation of the largest contradiction between rhetoric and action. Between what he speaks ( "Serbian national interests", "well-being of Serbia", "balanced policy between East and West" and similar nationalist rhetoric ...) and what, in the political sense, he does (signing of the Brussels Agreement, the neoliberal and anti-nationalist orientation in connection with the national economy strategy, active support to the gradual abolition of Serbian institutions in Kosovo, ratification of the agreement with NATO in 2016, completely ignoring the Eurasian integration processes in terms of political, military and economic cooperation, etc). Aleksandar Vučić, in terms of the contradiction between rhetoric and action, i.e., between words and deeds, applies the established form of media and propaganda strategy which is used in the United States. During and immediately before performing political and military actions (usually some aggression on the international scale), related to the rhetoric that follows the action, the US states denies doing the very thing they have set out to do. As an example, while carrying out the military aggression and war crimes of the United States after 1945, the official rhetorical support for these actions was worded as: "bringing freedom", "implementing democracy", being ''against the leader" but at the same time "sympathy for the population", and the similar hypocritical platitudes that, in addition to skillful lies, represent a desperate shortage of good taste ... Aleksandar Vučić - a perfect American student. Let us now devote attention to the political manifestations of the Eurasian integration processes within the present Serbian political space. Active partisans of Eurasianism in Serbia at this time can be divided into two camps; the first camp consists of honest Russophiles which, unfortunately, have a lack of personnel, resources, as well as of a serious and long-term political strategy. In this camp we can locate several "Russian minority parties," and political movements that sometimes, and at different levels, take part in the elections; in the other camp are those political options that are officially Eurasia oriented but are corrupt (in political terms), and are in some kind of synergy of interests with the ruling SNS. The foreign policy of the SNS is clearly Atlanticist (EU integration as one of the most important elements, and benevolence and gradual approach to NATO). In this camp, we can locate SRS, DSS, Dveri, and the SNP of Mr. Nenad Popović. This camp is the one with the “professional politicians” (in the negative sense of understanding of this notion), with the criteria that the term "politics" in a democratic, neoliberal context, is defined as mere struggle, if possible a successful one, to come to power in order to control the resources and finances, and not as an authentic belief and faith in any idea, ideology, or geopolitical orientation. Such politicians, consequently, must be corrupt, in order to avoid being in contradiction with the very notion of “politics” in the neoliberal context (which is “apolitical” itself, seen from the traditionalist perspective). The focus of such professionals is never on the idea, but on the pre and post election "mathematics " and interest. The master-puppeteer at this moment of the Serbian political theater is the SNS and Mr. Vučić (and on behalf of the Atlanticist centers of power). The geopolitical situation in which Serbia is in this moment is extremely critical. And it's very important in this respect to understand that only a radical and different political maneuver compared to what is being done so far, can redirect Serbia from its Atlanticist direction. And, thus, bring it back to its own national identity, and as a consequence - its own national interests. Namely, any continuation of Serbia's integration into the geopolitical Atlanticist zone represents a direct destructive action directed against Serbia’s long-term geopolitical, geostrategic, economic, cultural, spiritual and historical interests. We are witnessing a situation in which the country and the nation as its base, due to corrupt pro-Atlanticist governments over the last decade and a half, have put Serbia in a dangerous historical situation. In a situation where, if a hypothetical radical political action fails, this boat with a destructive and autochauvinist skipper, carried by strong and invisible currents, will obviously crash and sink, as Aleksandr Dugin said, near the cliffs of the "dead green land" somewhere west. The evil land which we have to close by all means, as "our religious duty". The key question is who in contemporary Serbian politics has a consciousness and an authentic negative attitude towards the "dead green land" while in the same time positive towards Eurasia, at the level of "religious duty", or at least their defined and articulated "intellectual" or "ideological" position. Few ... very few people have the profound understanding and knowledge to bring and explain the Eurasianist idea to the Serbian voters. Unfortunately, the "Russophiles" in Serbian politics are not sufficiently educated and grounded in the idea of ​​Eurasianism, and as well their political "Russophilia" is based on a very simple positive emotional feeling towards Russia (e.g., the first above-mentioned camp of political amateurs) or, on the other hand, use the "Russophilia "(the second above-mentioned camp of corrupt political options) as a way of neutralizing the authentic Eurasian initiatives within Serbian politics, and are used by the ruling SNS which holds firmly to its Atlanticist course (integration into the EU and, sooner or later, NATO). A hypothetical possible and efficient option in this moment would be, in a conditional understanding of this notion - a subversion of Serbian pro-Atlanticist politics, and counterpoising this with the Serbian national and state interests. The idea and final task of this subversion would be a homogenization of the Serbian and Russian political zone. The methodology would be the engagement of already existing political parties from Russia at the elections in Serbia. It resembles the situation between Serbia and Republika Srpska from the second part of the nineties when parties from Serbia participated in Republika Srpska elections. In this situation, what would at the first glance seem look like a loss of sovereignty, would essentially be the strategy of restoring sovereignty that was de facto handed over to the west, i.e., to Brussels and the EU, by the last two Serbian governments (led by the DS and the SNS). The critical point in this idea of ​​political subversion, or the action at the level of "grassroots" which is based on undoubted positive emotion towards Russia among the Serbs, is a connection between the authentic "Eurasianists" in Serbia, which are firmly rooted in the idea of ​​a Eurasianism and with sufficient political experience on one side, and the authentic Eurasianists within the Russian political scene or government. Similarly as in Serbia, the Russian political space is also the context of confrontation of various groups - authentic Eurasianists, liberals, the old and the inert frame of cadres of the previous historical period, the different centers of power who are fighting for their share of the political pie, etc. This connection between the necessary Russian and Serbian elements with the same objective may be essential for creating a new geopolitical constellation in southeast Europe and beyond. Methods: the setting puts in front of us the contradiction between Russian traditional geopolitical strategy that can be defined with the term "imperial strategy”, and as a counterpoint, the Atlanticist "network" strategy. Russia has always acted transparently and through official, diplomatic and political forms of communication with other countries. The US and other Western powers have often acted through application of various forms of special or hybrid war, as well as through various “network attacks” (or supports) on other states on many levels and; to use a metaphor – on several layers. Related to the context of the previous analysis, it would be necessary for Russia to emerge something that would to some extent resemble to a "network" attack. In this context - a network attack on the Atlanticist oriented government in Serbia. In particular - through communication with and through the support to the authentic Eurasian element , or said differently - "instrument" in Serbia (registration and engagement in elections of the political parties already existing in Russia). 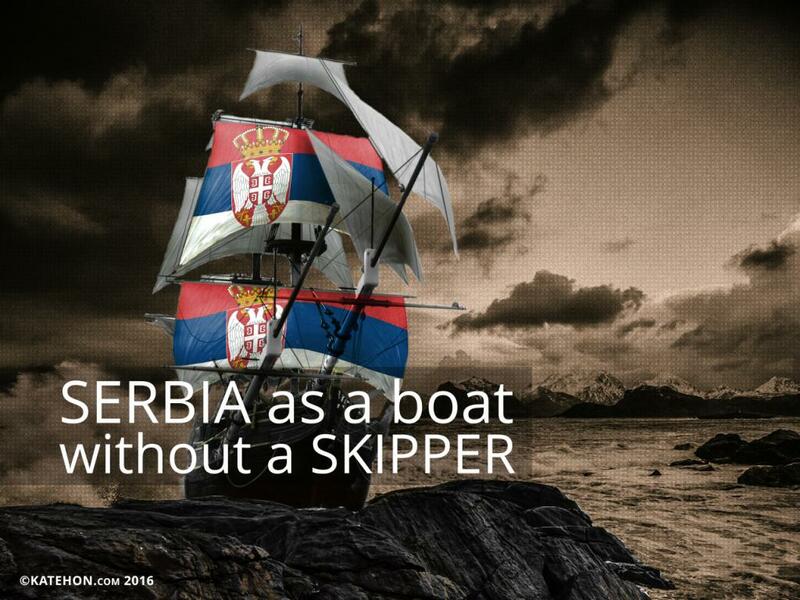 The final objective would be replacing the skipper and bringing Serbia back to the safe shores of East.